There’s a DIY wood sign painting technique going around right now that I want to share with you called the baby wipe method. It sounds weird I know, but the results are pretty great! Read on to find out how. Have you ever felt limited by stain options? All those browns, golds, and greys. If you want to enhance the look of the wood grain, stain is the only way to go. But what if I told you you could mimic the look of stain, but with every possible colour you can think of? -Baby wipes (From what I’ve gathered from other people’s experiences, every brand works different for everyone. I personally use Huggies because it’s just what I had on hand). 1. Make sure your board is sanded very good. The less slivers to grab at the baby wipes the better. 2. Squirt some paint either directly on your board or onto the wipe. A little goes a long way so start off small until you see how the wood is taking the paint. 3. Wipe the paint in the direction of the grain, and make sure its spread evenly and thinly. The wetness from the wipe will dampen the board slightly but it dries quickly. 4. Once you’ve covered the entire board let it dry. This will only take a few minutes! If you want to add a second coat now go ahead. 5. You might notice little pieces of cloth left behind that get stuck to the board from the wipe. If you sanded your board really well in Step 1 you shouldn’t have very many pieces here. Depending on the finish you are going for, use a finer grit (400) if you don’t want to take any paint off, or a lower grit if your going for a more distressed look. 6. (Optional) I usually seal my signs with a water based sealer before painting or putting vinyl words on them. On all 3 of these signs I only did 1 coat of paint and no distressing. And that’s it! Super easy right? I heard so many people raving about this method and once I finally tried it I was kicking myself for not trying it sooner! I used chiffon coloured chalk paint to paint the letters on the turquoise and pink signs, but haven’t decided what to paint on the brown one yet. Have you tried the baby wipe method? Comment and let me know how it turned out or tag me on Facebook or Instagram showing me your work! If you want to learn more about the best site to get FREE Commercial use fonts check out my blog post here! Want to see other signs I have made? Check out my gallery here. If you’re looking for wood sign stencil cut files to use in your own projects head over to my Etsy Shop! Great tutorial , love your samples and tips ! Hi Catrina! Thanks for stopping by! 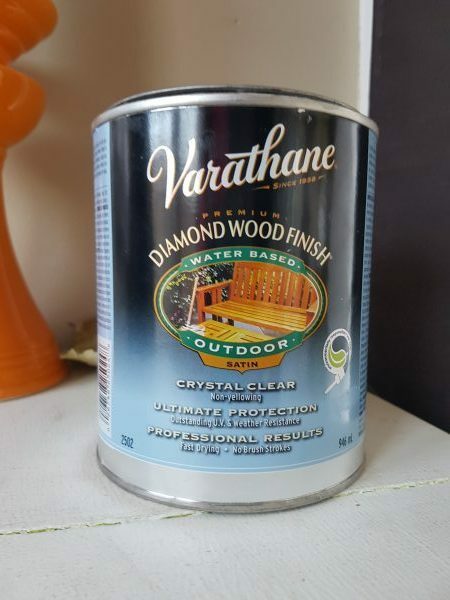 My preferred sealer for wood signs is Varathane water based satin sealer that is non-yellowing. It is a weather resistant sealer suitable for use wood items outside as well! I also use this sealer to make glitter ornaments. If you are staining wood for signs, it’s important to note whether you are using water or oil based stain so you can get the appropriate type of sealer.